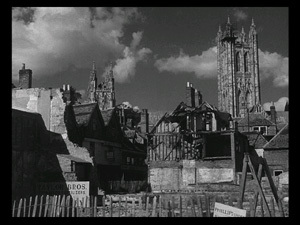 For their 1944 feature, A Canterbury Tale, Michael Powell and Emeric Pressburger (a.k.a. the Archers) tipped their hats to Chaucer's classic collection of stories, The Canterbury Tales. A movie about balancing old and new values in the face of modern advances and the haze of difficulty, it picks up Chaucer's device of religious pilgrims traveling to the British countryside and applies it to WWII England. A classic feel-good movie, A Canterbury Tale has finally come to DVD courtesy of the fine folks at the Criterion Collection. Three travelers get off of a train at a small English outpost: a British soldier on the way to his regimen, an American GI who jumped off a stop early by mistake, and a member of the Women's Land Army (a.k.a. a "landgirl") assigned to the area, filling an agricultural void left by men who have gone off to fight. They find themselves in Chillingbourne, a village in the Kent region, in the dead of night. On their way to the Town Hall to get situated, they are attacked by the Glue Man, a bizarre criminal who dumps glue into women's hair. The landgirl, Alison (Sheila Sim), ends up being his latest victim, and the trio unites to solve the mystery. Their exploits are like a charming precursor to Scooby-Doo, including a solution that involves an old man in a costume. Their sleuthing ends up having a greater effect on them than just solving the crime, however. All three begin to learn more about the history of the countryside. The town they have stopped in is the last bend on the Pilgrims' Road, the legendary path to Canterbury. The ultimate goal of any pilgrimage is to get to Canterbury Cathedral, where blessings are to be had. Their journey ends up being orchestrated under the tutelage of the slightly odd town magistrate, a cold fish named Thomas Colpeper (Eric Portman). Colpeper is more than he seems, almost acting like a divine hand to nudge his charges onto the proper path. Once they do arrive in Canterbury in the final reel, all of them rediscover something they thought they had lost. Given how beautiful A Canterbury Tale's cinematography is, it's hard not to feel just as blessed as our hapless pilgrims. Shot by Erwin Hillier, he and the Archers capture remarkable footage of the cathedral, both inside and out. Its enormity and detail is staggering. There are multiple reminders throughout the narrative that the world has gone topsy turvy due to the war. The older citizens in particular have a good eye for life being off kilter, as WWII isn't the first conflict they've lived through. Colpeper wants to preserve the history of the region he grew up in, and as a result, he is kind of a stand-in for Michael Powell, who himself is using A Canterbury Tale to share his birthplace with the ages. Each of the pilgrims has lost their way on their journey to Kent. Alison has sacrificed a fiancé to battle, and she has returned to Chillingbourne to work the land in an attempt to reconnect with him. He was a geologist before the war (everyone was something else before the war), and his excavation of Pilgrims' Road has brought her back to the site of their best time together. The American, Sgt. Bob Johnson (played by a real U.S. Army Sergeant, John Sweet), is a likable guy who feels disconnected from the life he left behind, as well as the girl whose letters have stopped arriving in the mail. Finally, Sgt. Peter Gibbs (Dennis Price) was an organ player who decided to play in a movie theatre rather than a church, a move indicative of his loss of faith in any sort of greater good. It's one of several sly jokes about motion pictures. Johnson is also a film fan, one who refuses to settle for a single feature matinee or any kind of free show. The danger of movies, Colpeper warns, is that its audience is merely sitting still, watching life happen instead of participating in it. And essentially, that's the fate the characters of A Canterbury Tale are saved from: a life of complacency. They all three will find new connections to all of the things they have let slip. It's a genuinely heartwarming climax, something the Archers were supremely skilled at. No one can match the duo for creating rarefied worlds filled with charming personalities who remind you that life is worth living. Somehow they manage to do it without ever making their audience feel they are being hammered with a message; nor do they sugarcoat everything to the point of rotting your teeth. The denizens of their small town don't ever feel forced, belittled, or contrived the way filmmakers so often do when trying to portray anyplace that's not a big city. Powell & Pressburger have too much of an affinity for human nature, enjoying the quirks that make us unique. My favorite scene in A Canterbury Tale is when Johnson joins a play-army of children for their pretend war. 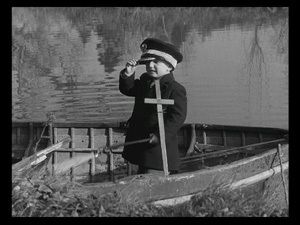 As they hurl fruit and rocks and whatever they can lay their hands on at one another, a small child in a naval commander's uniform stands in a rowboat on the river and cries over the loss of his vessel. Less adept directors would have overplayed it, but the Archers just let it stand, knowing it's delightful enough without adornment or comment. The fact that we are treated to some fantastic filmmaking on the way to this miraculous conclusion is just an added bonus. As I already noted, the footage of Canterbury Cathedral is breathtaking, but the shots of the fields of Kent are also gorgeous. In a scene where the four characters are standing in the tall grasses at the top of a hill, we see the whole of the town, and when Johnson notes how beautiful it all is, Hillier's camera backs him up by filling the whole frame with the green landscape. Juxtaposed against this splendor is devastating footage of the bombed-out sections of Canterbury. As the cathedral looms tall over the town, these pits of destruction end up being its opposite. Alison walks the edge of the phantom buildings, marked now by signs informing passersby of where the businesses have since relocated. They stand as potent symbols of both the consequences of war and man's resiliency in the face of it. Having captured the landscape of Canterbury at the time that they did, the Archers serve their own purpose of preserving values that may be lost, taking a snapshot of a moment in time where a population is at a crossroads and risks going the wrong way. Everything in the movie points towards reminding its characters not to rush too fast towards uncertainty when history has already solidified a foundation of knowledge that could ease some of the guesswork about the future. Even the seemingly silly Glue Man ends up in service to this theme when his full motives are revealed. His glue dumping is his attempt to stop young women in their tracks, to prevent them from letting themselves be corrupted (or, as it were, maybe stopping them from distracting the soldiers). Naturally, this is a rather extreme tactic, but it's also part of the balance that the Archers give the story. Not all of modernity is bad. Sgt. Johnson is probably the most obvious example of shifting values, representing as he does the American cultural invasion, but he's carefully given a firm background in a very traditional subject: wood. Similarly, even Alison and Colpeper come to an understanding during a tender hilltop confessional where Alison reveals the personal tragedy that caused her to so dramatically change her life from shopgirl to patriotic farmgirl. When you stop to think about it, the lesson the Archers give to their characters is also the one they give to their audience. When Alison and Johnson and Gibbs once more believe that miracles can happen, so do we--even if it's just a belief in cinematic ones. (So, take that, Colpeper!) That's the wonder of A Canterbury Tale, and the blessing Powell & Pressburger bestow on all who make the pilgrimage to the theatre--or, in this case, wherever you get your DVDs. Originally written July 15, 2006. For technical specs and special features, read the full article at DVD Talk.